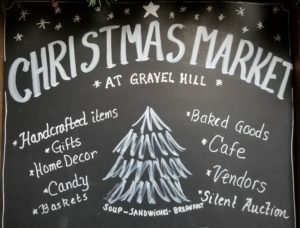 Gravel Hill’s annual Christmas Market is back with more magic, fun, and fellowship. Features include the Holiday Gift and Craft Shoppe, Silent Auction, outside Vendors, Ham ‘n Bean and Chicken Corn Noodle Soups, and the ever-popular Indoor Yard Sale. Items available will feature crafts and home décor, monogrammed items, homemade candy, vendors, homemade soup, baked sale including cookies to mix and match sold by the dozen, Friday dinner and Saturday breakfast and lunch. On Saturday only: Clothing Boutique, Cookies with Santa, and Yard Sale. The Ronald McDonald House, the Agape Family Shelter, the Phoenix Youth Center, and the Lebanon Rescue Mission continue to be the benefiting charities for the Christmas Market.